Flappy Bird goes as follows: you tap the screen to propel a tiny, pixelated bird upwards. Flappy Bird goes as follows: you tap the screen to propel a tiny, pixelated bird upwards. If you hit any of the green pipes in your way as you fly towards some unknowable, unreachable finish line, the game is over. The goal is simply to accumulate the highest score possible. Download and play Flappy Bird for free now! How to play: - Tap to flap your wings to fly; - Avoid pipes; - Try to get 4 medals: Bronze, Silver, Gold (hard), Platinum (very hard). Free Game Features: - Original game play; - Easy and addicting. 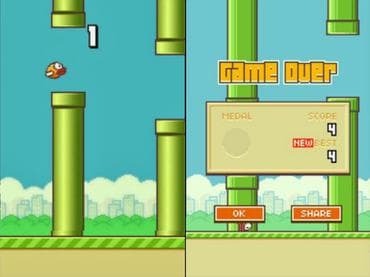 Если у Вас есть вопросы, связанные с игрой Flappy Bird пожалуйста используйте эту форму для связи с нами.